Varèse Sarabande Records will release a two-CD House Of Cards: Season 3 – Original Netflix Series Soundtrack digitally on September 11 and on disc October 2, 2015. The soundtrack features original score composed by Jeff Beal (MONK, THE DOVEKEEPERS). 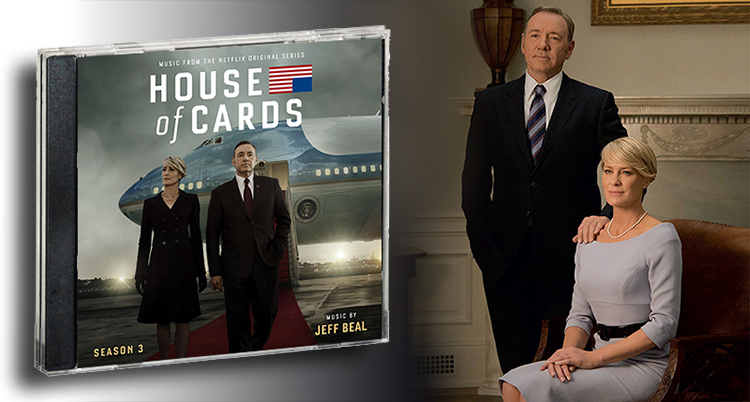 The HOUSE OF CARDS season 1 and season 2 soundtracks are also available from Varèse Sarabande. Award-winning composer Jeff Beal scores HOUSE OF CARDS, the Emmy® and Golden Globe®-winning original series, starring Kevin Spacey and Robin Wright. The show debuted in February of 2013 as Netflix’s first original series, unprecedentedly releasing all 13 episodes of Season One at the same time, generating worldwide attention for the bold new approach to the television model. In Season 3 President Underwood fights to secure his legacy. Claire wants more than being the first lady. The biggest threat they face is contending with each other. This Emmy®-winning original thriller series stars Golden Globe® winner Kevin Spacey as ruthless and cunning Francis Underwood, who will stop at nothing to conquer the halls of power in Washington D.C. His secret weapon: his gorgeous, ambitious and equally conniving wife Claire (Golden Globe® winner Robin Wright). Playing both the trumpet and the piano on the show’s main title theme, Beal sets the tone for the central themes of power, greed and manipulation on HOUSE OF CARDS. A lauded EMMY award-winning composer, Jeff Beal is a member of a new generation of passionate and talented composers. A graduate of the Eastman School of Music, Beal received his first national attention while in college as the recipient of an unprecedented 11 "db" awards from Downbeat Magazine for his recordings as a jazz trumpeter, composer, and arranger. Beal has been conducting film music concerts of his works both nationally and internationally including a suite from HOUSE OF CARDS at the Krakow Film Music Festival in front of 15,000 people earlier this year. “Season three was a crucial season for the relationship of Frank and Claire,” Beal explained. “The dramatic arc and disintegration of trust and respect between the Underwoods needed its own voice in the music." Beal continued, “I extended the use of the operatic soprano in season three. It's a sound never really heard in modern scoring, and somehow seemed to be a great sound for Clair Underwood's burgeoning power and strength. I used is especially in the season three finale."